If you wish to establish a parenting plan or child support payments in Washington family court, you may do so without an attorney. This article discusses the petition that can be filed either solely or jointly. The document is available on the website of the Washington courts. Washington Petition For Residential Schedule/Parenting Plan And Child Support PS 15.0100 Step 1: Indicate what you are petitioning for with a check mark. Give the names of both parents and all children. Washington Petition For Residential Schedule/Parenting Plan And Child Support PS 15.0100 Step 2: In section 1.1, give your name, indicate whether you are seeking a parenting plan, child support plan or both, and give the names, ages and county locations of all children concerned. In section 1.2, indicate whether the father has signed an acknowledgment or denial of paternity. 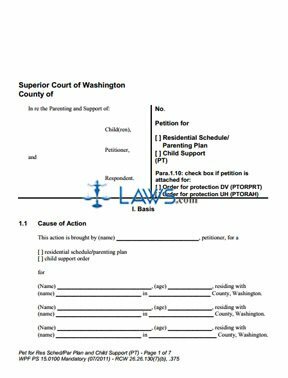 Washington Petition For Residential Schedule/Parenting Plan And Child Support PS 15.0100 Step 3: In section 1.3, indicate with check marks which statements concerning the court's jurisdiction over both parents are accurate. In section 1.4, indicate whether more or less than two years have passed since the filing of an acknowledgment or denial of paternity. Washington Petition For Residential Schedule/Parenting Plan And Child Support PS 15.0100 Step 4: In section 1.5, indicate which statements regarding the court's jurisdiction over the children is applicable with check marks. Washington Petition For Residential Schedule/Parenting Plan And Child Support PS 15.0100 Step 5: In section 1.6, indicate your wishes concerning child support payments. In section 1.7, answer all questions about residential placement. In section 1.8, note whether the state of Washington is entitled to reimbursement support or assistance given the minors in question. Washington Petition For Residential Schedule/Parenting Plan And Child Support PS 15.0100 Step 6: In section 1.9, note any continuing restraining orders which should be entered. Do the same concerning protective orders in section 1.10. Enter any miscellaneous information in section 1.11. Washington Petition For Residential Schedule/Parenting Plan And Child Support PS 15.0100 Step 7: Enter checkmarks next to all rulings you wish the court to make under section II. You or your lawyer should sign and date the form. Washington Petition For Residential Schedule/Parenting Plan And Child Support PS 15.0100 Step 8: The petitioner should sign and date section III. If your spouse agrees to your petition, they may file the joinder form on the last page.